A website that sells designer-only duds for kids whose no returns policy applies only to five areas that are home to large Orthodox Jewish communities says that its rules were enacted as a matter of business and not discrimination. Shan and Toad, an online boutique selling exclusive fashions for babies, girls and boys, is based in California. Its website offers full returns on non-sale items except swimsuits, less a $5 restocking fee, on all pre-authorized returns that are sent back within seven days of receipt to all customers. Except those living in Brooklyn, Monsey, Monroe, Lakewood and Passaic. The return policy, which is clearly posted on the website, was born out of necessity explained its Orthodox Jewish owner Shana Laub according to Northwest Now. Shan and Toad, which has over 20,000 Instagram followers and describes itself as the “chicest childrenswear e-boutique,” noticed a pattern of customers in those five areas routinely placing large orders, often ordering a particular item in multiple sizes hoping to get the right fit for their child or children. 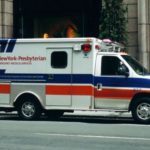 Those orders would deplete the store’s inventory, preventing other customers from placing orders, with items frequently returned days or even weeks later. In the interim Mrs. Laub was faced with the decision of ordering more merchandise at significant cost or being unable to fill customer orders. In many instances clothing was returned to the site in poor condition after having been tried on and shipped back and forth. Mrs. Laub said that when she told customers that she couldn’t accept returns to lateness or damages, they threatened to dispute the credit card charges. “The losses resulting from returns were becoming too great to sustain and we needed to implement a change,” said Mrs. Laub. Shan and Toad made the changes to its return policy a year ago and since then returns from the five designated areas has dropped from 34 percent to 13.3 percent. Mrs. Laub said that outside of those five locations, the store, which ships its luxury fashions worldwide, has just a 2.8 percent return rate. 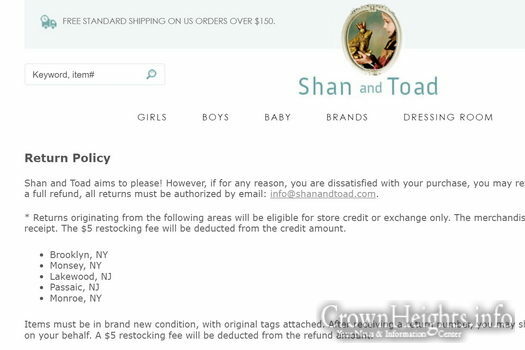 Tod Marks, a shopping expert and senior projects editor for Consumer Reports said that he has never encountered a return policy like the one at Shan and Toad, and he encouraged consumers to always familiarize themselves with any store’s return policy before making a purchase. Although New York State law, like many other states, does not require any stores to accept merchandise for returns, all stores in are legally required to post their refund policy. Stores that fail to do so are required to accept returns for 30 days from the date of purchase. New York State law does not distinguish between online and brick and mortar stores. 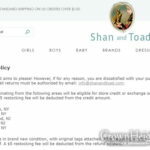 At least one Shan and Toad customer who asked to remain anonymous said that she had no problem with the store’s return policy, noting that Jewish owned clothing stores in Brooklyn rarely if ever offer cash returns. “Every other store has only store credit so it is all the same to me,” said the Brooklyn mother of three. Why the outrage?? They are a small company and if returns from those areas are killing them then they need to do something about it to stay afloat. It is totally believable that returns from those areas are excessive. Sometimes we abuse a system and wonder why there is a backlash. The entire world is not ours to use and abuse. We need to be mentchlich. Good on them. So it’s one of our own discriminating against us. So we can mess over our own and when they try stopping our bullying it’s called discriminating? You call that discrimination?? It’s called a sound business decision! Unfortunately, this is where culture and religion deviate from each other, and some make such a Chillul Hashem (buy/use/return), and give us Jews, especially Ultra/Orthodox, a bad name. Maybe the Rabbinate in all communities should emphasize basic human common decency, before teaching loftier lessons and chumras. What abuse? What chilul hashem? If a store makes an offer it’s perfectly ethical to take advantage of it. It’s also perfectly ethical for the store to stop making the offer, as has happened here. What happened here is not abuse, it’s simply a cultural trait. The old joke that Hashem created goyim because someone has to buy retail has a lot of truth to it, which is why it’s funny. We Jews like a bargain, and if we are offered a good deal we accept it. Many other people don’t have this in their cultures, and will often leave a potential benefit lying on the table. This is not ethically superior behavior, it’s just different, and businesses have every right to take notice of these differences and adapt their policies to them, just as they do when they notice that certain kinds of products sell better in certain areas than in others. Good for them! Really they shouldn’t ship to those zip codes altogether. All these people returning stuff after using them are foolish – there is an online record for all their behavior ad sof kol hadoros. One day we will see companies not be willing to do any business with people with this in their reputation. They will be stuck having to trade a cow or a goat in order to buy a shmateh. Ha! Yup soon everyone will need proof of Jewishness to determine if you are worthy of a sale or not! It’s a Brooklyn , or east coast thing. When I had a retail website, my biggest problems were from the East coast, esp. NY and NJ, and the last names ran the range of ethnicity. But acting like that is geniva at many levels, and probably some other averias as well. I changed my return and shipping policy for everyone because of comparable problems. Good on them! Some people abuse the return policy and this is the result. I support their business decision. Who can blame her? But she should have thought of a less public way to implement. Like when placing and order from a suspect zip code, a message would pop up with the no return clause. I for one will make sure my family does NOT shop there. Al pi halacha we are supposed to even pay Higher prices at a Time, than go to a goy. What does this say about this woman?? Huh? She isn’t preventing anyone from ordering, charging higher prices, or preventing returns. She is simply offering store credit or exchange only for areas known to abuse returns. It may sound weird, but nothing remotely halachically forbidden. Where is this “halacha” of which you speak? As a matter of fact, there is a halachah (Choshen Mishpat 175:41) that implies the contrary: ordinarily one may not sell his real estate to a non-Jew where this will cause problems for the Jewish neighbors, but this is true only “when he would have been able to sell or rent it to a Jew for the same price as the non-Jew is offering; but he is not obligated to sell it to a Jew for less.” Presumably the same would apply to buying from a Jew at a higher price vs. from a goy at a lower one. More to the point, aside from Dina’s (quite correct) point, halachah does not require any kind of return policy at all (unless there was an actual defect in the merchandise, not just that you ordered the wrong size or whatever)! Once a valid kinyan (act of acquisition) has been performed, neither party can renege on a deal unilaterally (Choshen Mishpat 189:1); and even before a kinyan, if the payment has already been made, the buyer can renege only if they’re willing to first accept “Mi Shepara,” a pretty serious warning by a Beis Din that Hashem will deal in His own way “with those who don’t keep their word” (ibid. 204:1,4). So yes, you may want to ask a rav a halachic question: do you have any right to boycott this store when they are 100% in the right halachically? Thanks. Next time I need a Rav iknow who to call! Your post addresses none of the ratifications. Who said anything about boycotting?? No one said anything about the balance of returning, but rather discrimintory practice, whether justified or not, against Yidden. Your pseudohallachic diatribe addresses none of the issues. Here the seller has a clear policy AGAINST Jews. Do you support BDS? It is clearly based on antisemitism. To those saying it’s good business, just make a universal policy, not one that clearly is discrimintory. Even if my Rav says it’s OK, I can choose to shop at another Yid. Question: Is there halachic basis to give priority to patronizing Jewish businesses? Answer: Toras Kohanim derives from the verse, “When you sell something to your fellow or buy from the hand of your fellow” (Vayikra 25:14), that one should give commercial priority to his Jewish brethren. This halacha is not mentioned in Shulchan Aruch, but is cited by numerous responsa. The poskim debate whether the law applies if the non-Jew sells for cheaper. Rama (Responsa #10) cites this law to give priority to an edition of the Rambam printed by Maharam Padua over a competing, cheaper edition printed by a non-Jew. He understands from the Gemara (B.M. 71a; Pesachim 21b) that the law applies even when there is a price difference between the two and there will be a loss in buying from the Jew. On the other hand, some achronim argue that this law is only “proper advice” (Korban Ha’eda on Toras Kohanim). A number of others maintain that it applies only when there is no price differential (Maharsham in Mishpat Shalom C.M. 189). Maharam Shick (C.M. #31) also maintains that a businessman does not need to buy from a Jewish supplier who is more expensive, but should do so if it is only an issue of convenience. There is a third, middle position advocated by some achronim, which will be discussed later, IY”H. So a post citing the Shulchan Aruch to explain the halachah is to you “a pseudohallachic diatribe.” Sounds like to you, halachah is whatever you want it to be. One wonders how you plan to stand before the Eibershter in twelve days’ time with that sort of casual attitude towards His will. To commenter “Many places”: Thanks for quoting those sources; I stand corrected – there is room to argue that this is binding halachah. However, it is still true that there is no room to argue that geneivas daas is forbidden, and “buying” items in order to take advantage of the return policy is just that. Every Friday I buy flowers for shabbos at Costco, and return them on Sunday. See what the Gemorah Yoma (86a) says about how serious the sin of Chilul Hashem is. I don’t agree with the store policy. My code of ethics matches the denier of my tights. I wouldn’t think of returning something used if there wasn’t a serious manufacturing flaw. Singling out publicly a group of people is wrong. However they could (and should) implement the policy that only un-used items can be returned. Unless there is a serious manufacturing flaw. (The item in question had a hole upon arrival to the customer.). HOWEVER, I have heard for years, that LandsEnd does not take returns from the “jewish zipcodes”, because they found that people were wearing the clothes and then returning….at a large amount. we have to do our best to be menschlich and keep halacha.